We are in the process of final preparations for Easter Masses. 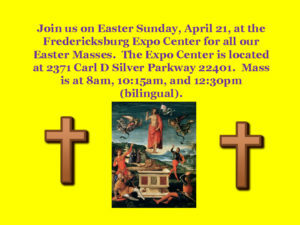 Once again this year, we will be celebrating Mass at the Fredericksburg Expo Center. For the past (how many?) years we have been gathering at the Expo Center—a lot of work—to provide a proper joyful welcome and ensure that everyone might have a seat and a parking space. And over the years we have perfected the art of liturgy for 3,500 faithful with the proper solemnity and reverence, joy and exultation that is proper for Easter Sunday, and still not let it last longer than a typical Mass in church. In the beginning there were many who felt that such a thing could not be held in a place such as the Expo Center: all these years now we have repeatedly heard from people who have newly discovered the experience of thanking and praising God in the joyful context of so broad an assembly celebrating the new life of Jesus’ resurrection. You can’t imagine the impact of it unless you are there. Is this us? We are a community that is so large and alive. Don’t tell anybody, but the Expo Center is now holy ground – we have blessed it by the sacred rites of Mass and sprinkled generously the assembly (and the building) with the holy water of baptism! I wanted to pass on a little advice on this weekend before we begin the solemn observances of Holy Week. Come to Expo early, just as the previous Mass is ending. The 8am Mass is usually 3/4 full, maybe a little more. That means that there are about 900 seats waiting for you. The 10:15 is basically full, although there are always some seats to be found on the far end of the room from the entrances. The 12:30 Mass, which is a fascinating and even more joyful Mass combining the cultures of North, Central and South America, has the most seats available and you are always welcome. The Easter Vigil Mass in the church will begin at 8:30 and last until about 11:30. See the bulletin board in the vestibule of the church to learn about all the people who will be joining our church this year. Please keep all of them in your prayers during the coming week, a most important week in their lives. This year we have bought gifts for everyone who comes to Easter Sunday Masses. 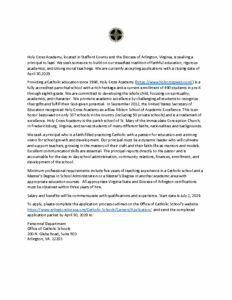 You may have heard about the pastoral letter of Bishop Loverde, “Go Forth with Hearts on Fire,” a wonderful piece on the new evangelization and how you can become involved personally in the work of the Gospel. We have bought 7,000 copies to distribute this Easter, as well as holy cards commemorating the soon-to-be saints John XXIII and John Paul II. These are our gifts to you for this season of joy. Of course, we will be looking for an army of volunteers to help at all the Masses to distribute these as people leave—if you are interested, please call the office. It will take only a little time, and as we finish you will find that traffic has quieted down outside. Well, I don’t intend to get ahead of myself. We still have before us the most intense and reflective time of all the year. We hope to enter into the very suffering and death—and resurrection of Jesus as members of his Body, the Church. It is my prayer that we can find it in our hearts to make this Sacred Triduum, Holy Thursday, Good Friday, Holy Saturday and Easter Sunday a time of deep prayer and sacrifice. It is in the unfolding of Christ’s mysteries that we discover the reality of ourselves and the meaning of our lives. It is the selfless offering of Jesus that has saved us, and it is the selfless offering of ourselves as we recall his saving love that will continue to advance this salvation for all the world. Don’t forget – Jesus came, he died and he rose from the dead that ALL might be saved. So don’t just share the secret with those who are friends—change the world.